Chapters, Supporting Members, and Advocates around the globe pulled out all the stops to raise awareness in celebration of World Lymphedema Day. 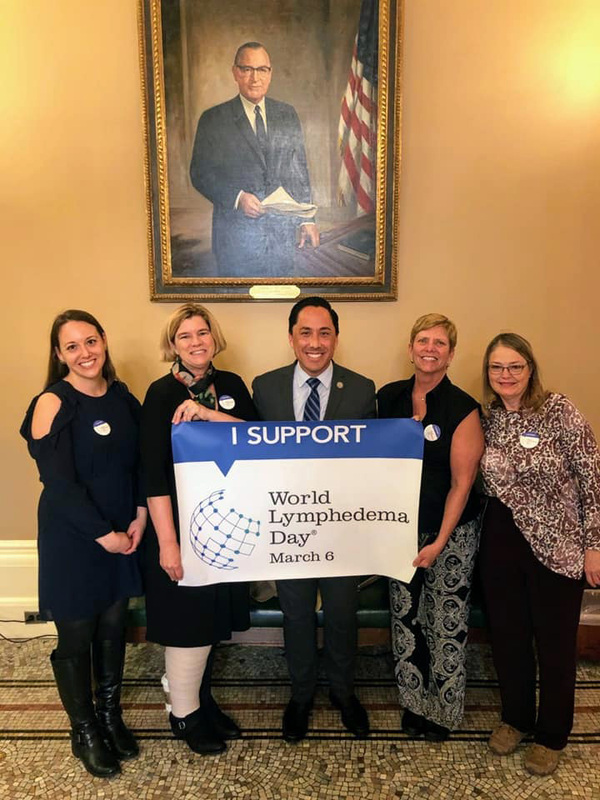 From Hawaii to Japan there were iconic buildings, bridges, and homes lit in teal; informational tables were present at hospitals, marathons, and therapists' offices; and state and municipal legislatures officially proclaimed March 6 World Lymphedema Day. LE&RN applauds the LE/LD community for its perseverance and accomplishments. Too many to list in full, we highlight here many of the activities that the Chapters initiated. There were so many more activities around the world that have been posted on Facebook and the links can be found on the Chapters’ homepages. Following on the heels of presenting lymphedema panels and lectures at national conferences in January, LE&RN's India Chapter embarked on another ambitious World Lymphedema Day program. On March 6, Dr. Gogia and Chair, Arun Rekha (pictured at right), hosted a national webinar featuring eight speakers. Topics included LE physiology, management, care innovations, and the role of surgery. Reprising their roles at the January conferences, LE&RN Scientific Advisor and Centers of Excellence Chair, Professor Peter Mortimer, and LE&RN President & CEO William Repicci, presented via video and livestream. 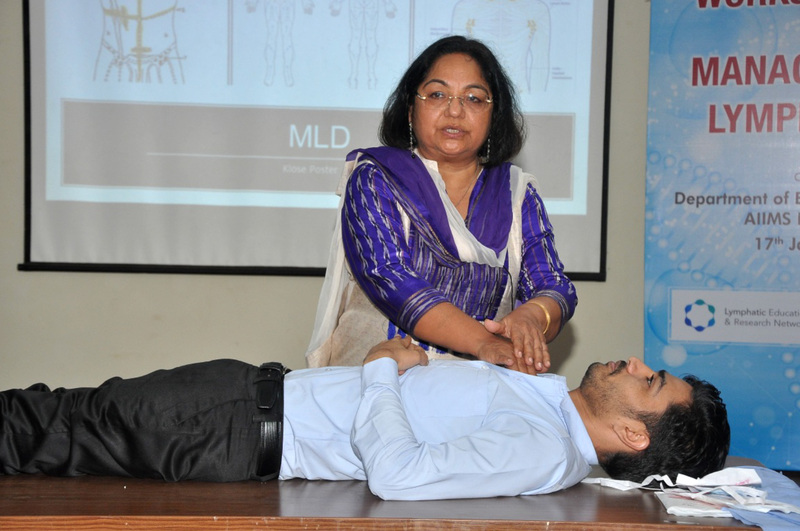 In addition, on March 2, LE&RN India conducted a CME Lymphedema Workshop at All India Institute of Medical Science Bhopal (AIMS Bhopal) which was attended by one hundred doctors and nurses. 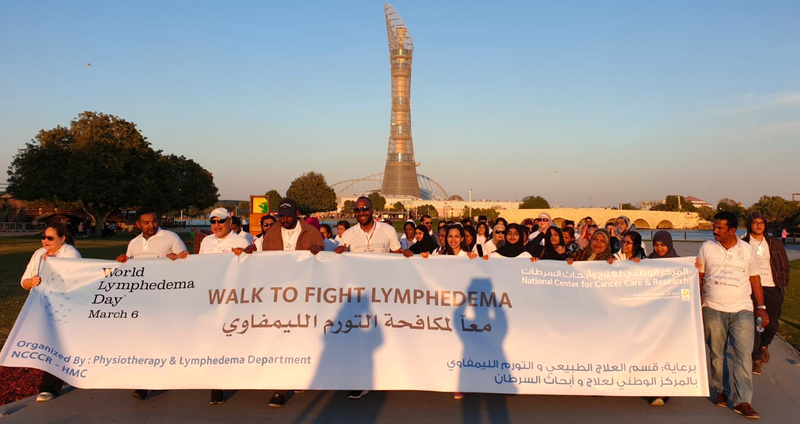 Soon to open its first LE&RN Chapter, Qatar held a Walk to Fight Lymphedema (pictured at left) and hosted a Lymphedema Awareness booth at the National Cancer Centre for Care & Research. The Israel Chapter spread awareness by hosting booths at health clinics, health-related facilities, and at the Sea of Galilee Marathon. Volunteers provided information and assured people living with lymphedema and other lymphatic diseases that their National Health Law provides assistance with costs. Ottawa’s Mayor, Jim Watson, presented the renewed proclamation to Canada’s LE&RN Chair Stephen Kelland (Stephen is pictured in the far left of the photo to the right next to Mayor Watson and“Co-Champion for the Cause” spouse, Elaine McArdle). Ottawa was the first-ever municipality to proclaim WLD in 2016 and has renewed its resolution ever since. On behalf of the City Council, Mayor Christian Provenzano of Sault Ste. 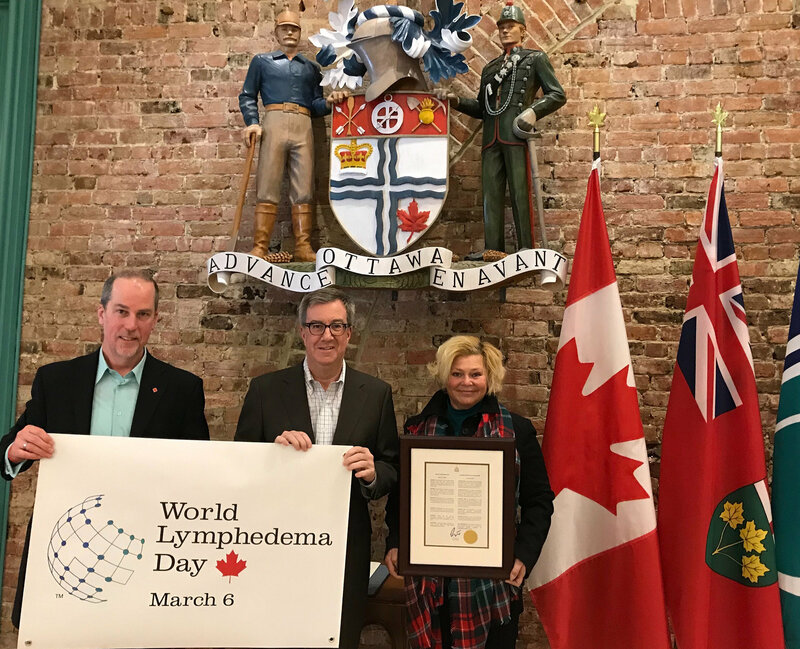 Marie will issue a proclamation in support and recognition of "World Lymphedema Month" on March 18. Bathurst (New Brunswick), Fort Erie, and Welland (Ontario) also formally proclaimed WLD. The New York and Canada Chapters’ teal lighting campaigns, spearheaded by Lisa McPartland, Stephen Kelland and Amanda Henrie, illuminated Niagara Falls and the Peace Bridge on both sides. Ontario also lighted the CN Tower and Bridge 13. In Buffalo, the Electric Tower, Big Ditch Brewing Company, Curtiss Hotel, Seneca One Tower, Buffalo and Erie County Botanical Gardens, and the Bell Tower of Rockwell Hall at Buffalo State College were lit up in teal; in Rochester, Tower 280 at Midtown, Xerox and Legacy Towers as well as the Rundel Memorial Library; in Syracuse, it was the Barclay Damon Tower, Hendrick’s Chapel and the Hall of Languages at Syracuse University (pictured in banner photo at top; photo credit: Amanda Henrie). In other states, the Massachusetts Leonard P. Zakim Bridge was lit in teal for a second year. Co-Chairs Cathy Holley and Lisa Palin held a celebration overlooking the bridge that evening. In Colorado, the Clocktower Cabaret ignited Denver thanks to Lara Davies. In California, the Chapter took it to another level by promoting decorating the outside of your home with teal lights. The New York State Assembly and Senate proclaimed WLD by Resolution for the fourth year. Newly elected Senator Andrew Gounardes has embraced our cause and will take the lead in sponsoring LE/LD research and insurance legislation currently before the Senate. Senator Gounardes honored Advocate Tina Himaya, who addressed the Senators in the chamber, recounting her personal battle with LE. Tina is currently sharing her story, entitled What About Us? Living with Lymphedema, onstage at the Duplex Cabaret in Greenwich Village. Proceeds benefit LE&RN. Chair Louise Tanswell led the initiative for Hawaii’s first WLD proclamation. 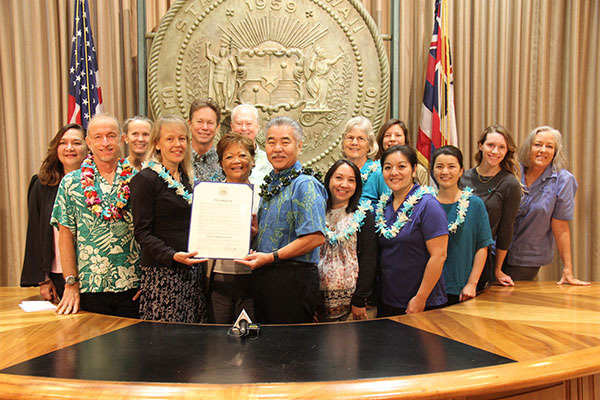 Attendees (pictured at left) at Governor David Ige’s Resolution reading included Louise, several therapists, and Mikey Wolper, a competitive body surfer and cancer survivor who is living with LE. The Governor had never heard of LE/ LD and was shocked to learn that it affects 250 million people worldwide. The ceremony was also attended by the Hawaii Executive Director of the Susan G. Koman Breast Cancer Foundation, the President of the Hawaii Chapter of American Massage Therapy Association (AMTA), as well as family and friends. Please visit the HI Chapter FB page for other initiatives and to follow Mikey Wolper's story. Assemblyman Todd Gloria read the WLD proclamation submitted by the California Chapter (pictured at right) at the passage ceremony. Chapter attendees Sarah Brunskill, Barbara Harmer, Amy Catarina, and Shelley Denyer agreed it “was a life-changing experience.” California municipalities Coronado, Imperial Beach, Pleasanton, San Jose, and San Diego also had their premier resolution readings. Colorado Chapter Co-Chair, Angela Marquez, shared her personal story at Klose Training School’s LAD event. The Maryland Chapter WLD event had a special guest speaker, Delegate Alfred C. Carr and Erin Sokalsky, ATC, PTA, CLT_LANA, Sr. Clinical Education Manager at medi USA. Organizers and Co-Chairs June Dunn, Jessica Fleming, and Debi Simmons thank sponsors medi USA, Jobst, L&R USA, Tactile Medical, and D&J Compression. 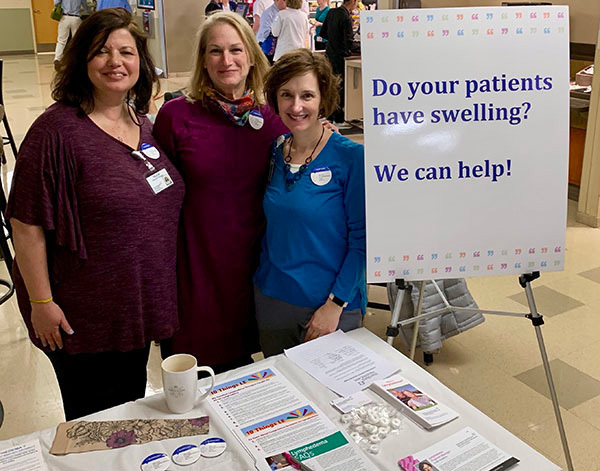 Connecticut Chapter Chair, Michele Watson, partnered with Hartford Healthcare Rehabilitation Network to sponsor informational tables at MidState Medical Center (Meriden), Hartford Hospital, (Hartford) and Hospital of Central Connecticut (New Britain.) And she worked with Middlesex Health to sponsor tables at their Middlesex Hospital and Essex locations. We also want to thank Texas Chair, Vern Seneriz widely known as Lymphie Strong, and Canada’s Stephen Kelland, aka Canada MALE (Male Advocate for LymphEdema) Lymphedema - LE Nexus Canada, two of our prolific and popular advocates on social media, who daily promote LE&RN, WLD, and our initiatives. We are all fans! These are just a few of the remarkable LE&RN Chapter efforts that have inspired the lymphatic community around the world to raise their voices, tell their stories, and advocate change by reaching out to local politicians. Please explore and “like” all of the Chapter Facebook pages. There is a global movement creating change—join it!